Google Fusion Tables allows you to create data visualisations including maps, graphs and timelines. It is currently in beta but is already being used by many journalists, including some from key news sites leading the way in data journalism. To find out how to get started in data journalism using Google Fusion Tables click here. Below are screengrabs of the various visualisations but click through to the stories to interact and get a real feel for why they are great examples of data journalism. What? A map with the location of every death in Iraq plotted as a datapoint. Why? Impact. 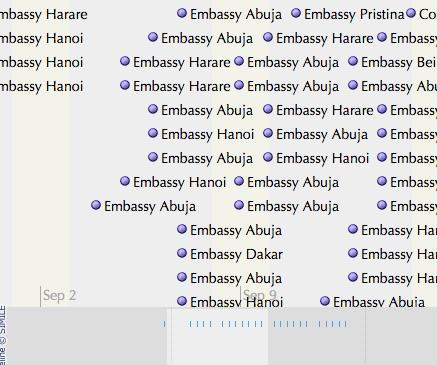 You must click the screen grab to link to the full visualisation and get the full scale of the story. What? This is a nifty storyline visualisation showing the cables sent in the weeks around 9/11. Why? It’s a fantastic way of understanding the chronology. 3. The Telegraph: AV referendum – What if a general election were held today under AV? What? A visual picture of using the hypothetical scenario of the outcomes of the 2010 general election if it had been held under the alternative vote system. Why? A clear picture by area of the main beneficiaries. See how many areas are yellow. What? A crowdsourced project which asked a radio station’s listeners to text in details of the progress of a snow clean-up. The datapoints show which streets have been ploughed and which have not. There are three maps to show the progress of the snow ploughs over three days. Why? As it uses crowsourced information. Remember this one next winter. What? The Texas Tribune is no stranger to Google Fusion Tables. 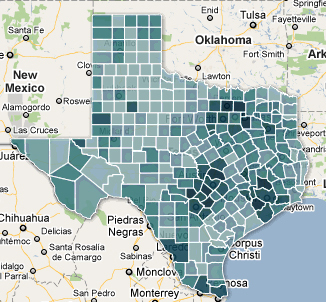 This is map showing how many people of hispanic origin live in various counties in Texas. Why? A nice use of an intensity map and a great use of census data. You can find out much more about data journalism at news:rewired – noise to signal, an event held at Thomson Reuters, London on Friday 27 May. This entry was posted in Data, Design and graphics, Handy tools and technology, Online Journalism and tagged Data journalism, data visualisation, google fusion tables, online map, texas tribune, The Guardian, the Telegraph on May 20, 2011 by Sarah Marshall. Online Journalism Scandinavia this week looks at innovate use of Google mash-ups and online databases by the Norwegian press. “Computer programming is also journalism,” Espen Andersen, the man charged with bringing the current affairs flagship of Norway’s public broadcaster (NRK) kicking and screaming into the internet age, told Journalism.co.uk. He should know. 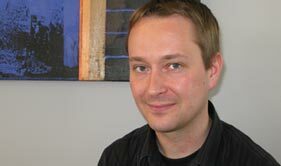 Andersen is one of Scandinavia leading practitioners in mashing-up news and creating new and compelling methods for ‘doing journalism’. Aside from being an able producer of interactive maps, he’s also an advocate for making programming an essential and commonplace skill in the newsroom. 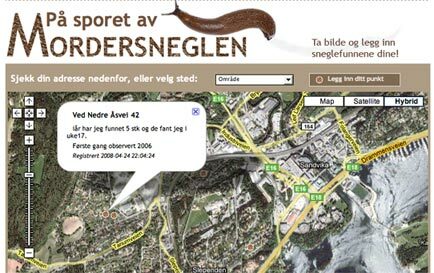 Andersen started running online databases and mash-ups for a local newspaper in Norway creating – amongst others – interactive stories about snails reeking havoc across the regions gardens. The principles may be the same but the subject matter has changed somewhat now he’s at NRK, where his most recent creation was a database mapping Norwegian politicians; how they vote, which boards they sit on and with whom. “The idea is to make information about these networks more easily available,” Espen Andersen told Journalism.co.uk. He has been brought in to help Brennpunkt, the Norwegian equivalent of Panorama, use online tools more effectively in both gathering and presenting information. His Politikerdatabasen creation currently contains information on all members of parliament in Norway and will expand to include information on the country’s 11,000 local politicians in May. “This project is just as much a journalistic project as making a TV-programme or a documentary. It’s all about presenting information that is valuable to the audience,” said Andersen. The aim of the project, he added, is to turn the database into a broader ‘power database’ by mapping political and corporate networks across Norway. This mapping project followed the creation for another recent Brennpunkt documentary of a network map of the country’s oil industry. “I think it is absolutely key to bring programmers into the newsrooms so they can get involved in journalistic projects at an early stage. “Programmers can create solutions to process large quantities of information, e.g. from public sources, and present it in an engaging and orderly manner,” Andersen said. Before joining Brennpunkt, Andersen created several high-profile online databases and mash-ups for local newspaper Budstikka. “I learned quite a bit about what kind of stories engage people when I worked at Budstikka: it is often issues that are very close to them. For instance, we made an online map where people could fill in their parking fines,” he said. Other projects that were big hits with the local community was an interactive map detailing which parts of the region were most troubled by snails killing off plants – a huge problem for passionate garden owners in the area (see main image), and an event map on Google maps. The latter showed all events taking place in the area the newspaper served, and even garnered international attention. “It’s typical of working for a local newspaper that you think you are working on a really big story on political budgets and trends, and you find people do not click on the story at all,” Andersen (above) said. Information for the databases and maps, he added, are usually taken from publicly available listings, databases and other sources such as the tax lists, Company’s House, polling companies. “However, it is a problem, especially for local newspapers, that public institutions often charge big fees for this information which has been gathered on behalf of the public, using the taxpayers money,” he said. These few problems aside, he’s hopeful that in a few years programmers in the newsrooms will be as natural as having picture editors. This entry was posted in Citizen journalism, Journalism, Multimedia, Online Journalism and tagged able producer, advocate, Budstikka, Data journalism, Espen Andersen, Europe, Geotagging, google, high-profile online databases, information about these networks, internet age, Journalism.co.uk, local newspaper, Mapping, Norway, oil industry, online databases, Online Journalism Scandinavia, online map, political and corporate networks, public broadcaster, Scandinavia on April 28, 2008 by Kristine Lowe. Scripps-owned US newspaper the Rocky Mountain News has created an online map of its news, business and sports features to give readers a better sense of where news is happening. “We created the feature because we thought users might be interested in where news occurs. Oftentimes in metro areas, a street address means nothing. 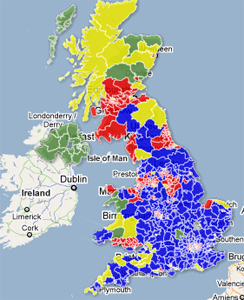 Map My News brings home how close news is happening,” Mike Noe, the paper’s interactive editor, told Journalism.co.uk. Noe said there are plans afoot to connect the archive of mapped stories with a user’s postal code or neighbourhood to enable filtering by geographical area. He also indicated that a combination of Map My News and YourHub.com – a sister site of the RM News, which allows users to post their own news and blogs – would be desirable for the website. This entry was posted in Newspapers, Online Journalism and tagged interactive editor, Journalism.co.uk, Mapping, Mike Noe, online map, Rocky Mountain News, sister site, the RM News, The Rocky Mountain News, YourHub.com on February 27, 2008 by Laura Oliver.